Nominated for Best Television Series – Drama for The Handmaid's Tale, Samira Wiley looked stunning on the Globes red carpet in a Romona Keveža Collection black A-line stretch crepe gown, featuring a gold floating architectural feathered neckline from the Fall Winter 2017 Collection. The Handmaid's Tale went on to win the award that night and Samira alongside the whole cast beamed from on stage. 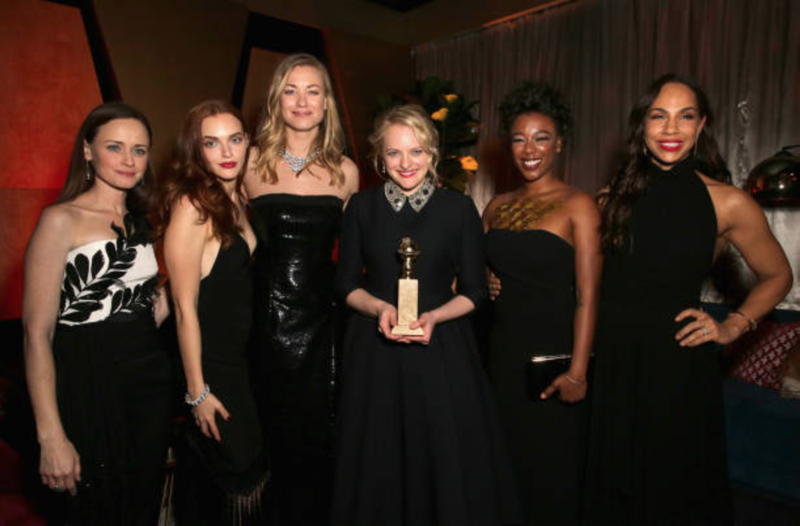 Later, at the Instyle Post-Golden Globes party the female players from The Handmaid's Tale got together for this beautiful shot, all dressed in solidarity for the #TimesUp movement.